When Louis and Auguste Lumiere first showed their short film The Arrival of a Train in 1895, they certainly had no inkling that, almost 100 years later, it would be the film-within-a-film in Francis Ford Coppola’s 1992 adaptation of Bram Stoker’s Dracula. Nor could Carl Theodor Dreyer have suspected that his 1928 feature The Passion of Joan of Arc would one day be the major inspiration for Mel Gibson’s hugely successful The Passion of the Christ (2004). But no matter where these and other early filmmakers envisioned the medium in 100 years, or whether they even believed it would last that long, the films we see today are undeniably the legacy of these pioneers of a nascent art form. Besides the Lumiere brothers, who basically invented the scene with their early one-reelers, the earliest major influence on today’s cinema was the French magician turned movie-maker, Georges Melies. His cinematic sleight-of-hand in short films like A Trip to the Moon (1902) brought about the innovation of stop-motion photography, a precursor of today’s animated films, as well as a noticeable influence on special effects wizard Ray Harryhausen (the 1981 Clash of the Titans) and Czechoslovakian puppet animator Jan Svankmajer (1988’s Alice). A Trip to the Moon was also the first science fiction film, which eventually led to more scientifically grounded films like Alien (1979) and 2001: A Space Odyssey (1968). The American filmmaker Edwin S. Porter also contributed a great deal to the advancement of the new art form. Originally a sailor and electrician, Porter made one of the most important films of the first 20 years of the cinema with 1903’s The Great Train Robbery, a prototype of the popular westerns of decades later. It also introduced many cinematic techniques that had not yet been used, including color tinting, close-ups and panning shots, films having been mostly shot from single, static set-ups until that point. Another innovation The Great Train Robbery introduced was the matte shot, a kind of superimposition in which one set of images is photographed in front of a screen, on which a previously photographed “background” is projected; this technique was thereafter widely used well into the 1960s, and even occasionally employed today, as in Quentin Tarantino’s 1994 film, Pulp Fiction. In addition, The Great Train Robbery could be said to be the first example of cinema violence, a concept that became extremely controversial in the late 1960s and early 1970s, eventually leading to the MPAA motion picture rating system still in place today. The Great Train Robbery made Porter the most famous and influential American director of his time, but he was eventually displaced by one of his own writers, David Wark Griffith. D. W. Griffith, as he is more widely known, found his success as a director in 1908, working for the Biograph Company. In 1909, he made A Corner in Wheat, an anti-capitalist short based on the work of Frank Norris, whose novel, McTeague, was later the inspiration for Erich von Stroheim’s Greed (1924). 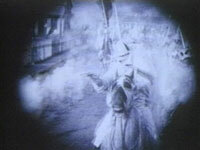 Griffith went on to make The Birth of a Nation, America’s first feature-length film, in 1915. The film was a great advance in cinematic storytelling and is still recognized today as one of the greatest motion pictures of all time, but its portrayal of emancipated slaves after the Civil War was offensive to many even in 1915, and much of the film is laughable today. According to Griffith (or, to be fair, to the Rev. Thomas Dixon, on whose novel Birth was based), at the end of the War, rich plantation owners were not only displaced from their land, they were also relentlessly persecuted by ex-slaves and poor carpetbaggers. Who knew rich white folks had such a hard time? Luckily, one heroic white man founds the Ku Klux Klan, an apparently misunderstood organization that the film posits was the savior of America as we know it. Despite the controversy, or perhaps because of it, Birth was a box office success Griffith would never again equal. His next film, Intolerance, was a spectacular failure. Budgeted at over $400,000, it was the most expensive American film up to the time of its release in 1916. It was also years ahead of its time in terms of set design and other technical elements, including the use of a crane to capture the multi-layered Babylonian set created by Walter Hall. Unfortunately, due in part to poor timing, the film never made its budget back and effectively put Griffith in a lifetime of financial debt. It did not, however, end his career. Probably his most successful and accomplished film after The Birth of a Nation was 1919’s Broken Blossoms, a sad and beautiful tale of forbidden love and paternal brutality. In this regard, Spike Lee’s Jungle Fever (1992) is an interesting parallel: the two films share themes of interracial romance, as well as shocking incidents of a father killing his child. On a lighter note, Griffith was also a major influence on other filmmakers of his time, including Mack Sennett, who later founded Keystone Studios. Though Sennett’s humor was broad, crude, and not actually very funny by today’s standards, many great comedic talents got their start at his studio, including Charles Chaplin, Roscoe “Fatty” Arbuckle, Harold Lloyd and W.C. Fields. Arbuckle soon outgrew Keystone and began directing his own short films. Some of these, including The Cook, featured Buster Keaton, who went on to be one of the greatest talents of the American silent cinema. 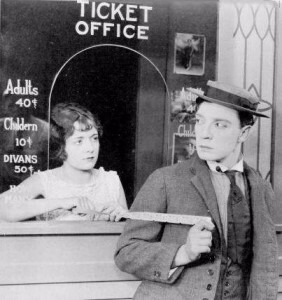 “Buster” was actually a nickname given him as a child by the great magician, Harry Houdini, and the love of magic tricks and stunts is evident in Keaton’s films. In fact, modern actor, director and amazing stuntman Jackie Chan can be seen as a descendant of Keaton’s work, using the same incredible timing, athleticism and resilience to create cinematic joy. Both suffered for their art as well, regularly breaking bones and sustaining other injuries while doing all their own stunts. In fact, all the silent-era comedians did their own stunts, but Keaton’s were probably the most dangerous. He broke his neck making his 1926 feature, The General, which involves many dramatic stunts on board a moving steam engine; in one scene, Keaton is knocked off the train by a deluge of water, landing with the back of his neck across the rail. He didn’t find out until years later that a fracture had occurred. Keaton’s 1924 film Sherlock, Jr. was extremely innovative in that it introduced the now-standard convention of the out-of-body dream sequence, using double exposure to give the impression of Keaton’s spirit-body separating from his physical one. Another interesting technique Keaton pioneered in this film was later an inspiration for Woody Allen’s 1985 film, The Purple Rose of Cairo. It is a scene in which Keaton actually walks into a movie screen and becomes part of the action. According to Keaton – as quoted in Film Quarterly, Fall 1958 – this is how the effect was accomplished: “We built what looked like a motion picture screen and actually built a stage into that frame … so I could go out of semi-darkness into that well-lit screen right from the front row of the theater right into the picture.” When the scene in the “movie” changes, then, amazing precision had to be used to ensure that Keaton was in the exact same position from take to take. 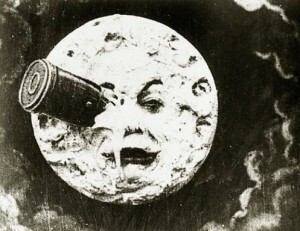 The illusion is perfect, and it is innovations like these that make Keaton one of the premier filmmakers of all time. In Bernardo Bertolucci’s 2004 film, The Dreamers, two of the central characters argue over who was the greater filmmaker, Chaplin or Keaton. Clearly, Keaton was a huge benefit to the advancement of the art, but Chaplin is, of course, more popular and widely known, in part because he was more prolific. Like Keaton, Chaplin began in vaudeville and did his own stunts, though they were not quite as spectacular as Keaton’s. As Andre Bazin notes in film critic Andrew Sarris’s 1967 collection Interviews with Film Directors, Chaplin’s cinema was “a comedy of space, of the relation of man to objects and to the exterior world.” This is certainly evidenced in Chaplin’s 1916 short One A.M., in which he drunkenly encounters a variety of objects in his house, as well as in his 1925 feature, The Gold Rush. His iconic dance with two rolls on forks, creating the comical impression of two tiny legs supporting his enormous head, has been imitated many times, most notably in Benny and Joon (1993), starring Johnny Depp, and an episode of The Simpsons in which Grampa takes up Chaplin’s immortal forks. The antithesis of Chaplin’s style, according to Sarris in the aforementioned book, is the montage formula originally developed by Lev Kuleshov and later expanded upon by Sergei Eisenstein. Kuleshov’s famous experiment in montage showed that the essence of cinema is editing: by cutting together a single close-up of an actor’s face with three different images, he made the audience interpret three different expressions on the actor’s face, which, of course, remained the same throughout. The impact of this experiment reaches throughout cinema history, from Eisenstein, to Hitchcock, to filmmakers like David Fincher and Darren Aronofsky today. Eisenstein’s 1925 film, The Battleship Potemkin, is an ideal example of the power of montage. In one scene toward the end of the film, static shots of three stone lions are cut together in succession so it appears as though the lion is rising to its feet in solidarity with the rebelling sailors. But the greatness of Potemkin is not entirely in the editing. Earlier in the film is a brilliant lighting technique, in which a priest on board the ship holds a crucifix and sternly reprimands the sailors; the flared light behind him suggests the fires of hell. Of course, the most famous sequence in the film is the showdown on the Odessa steps. As the Cossacks fire upon the Odessa citizens who support the revolution, a baby carriage perilously bumps down the stairs. This scene was quoted in Brian DePalma’s 1987 film, The Untouchables, which was in turn spoofed in The Naked Gun 2½: The Smell of Fear (1991). Potemkin is an overtly political film about the use of technology in order to seize power. In his essay “Politics and the Silent Cinema,” published in the 1988 book Visions and Blueprints: Avant-Garde Culture and Radical Politics in Early Twentieth-Century Europe, Michael Minden contrasts it with Robert Wiene’s masterpiece of German Expressionism, The Cabinet of Dr. Caligari (1919), a film which Eisenstein “regarded as negative, unhealthy and representative of a futureless introspection which affronted the vibrant young medium of film.” It has also been called “something of a dead end” because “the artificiality and limited storytelling potential of such purebred expressionism restricted its use,” according to Louis Giannetti and Scott Eyman in their 2001 book Flashback: A Brief History of Film, but it has influenced modern cinema more than it might seem at first glance. Its geometrically impossible set design is a clear influence on filmmakers like Tim Burton and David Lynch; the somnambulist, Cesare, could easily be one of the zombies in George A. Romero’s Night of the Living Dead (1968); and it is also notable as perhaps the first film with a twist ending, a clear precursor to later supernatural films from Carnival of Souls (1962) to The Sixth Sense (1999). Another important film of the German Expressionism era is F.W. Murnau’s Nosferatu (1922). Loosely based on Bram Stoker’s novel Dracula (though not loosely enough to prevent Stoker’s widow from suing Murnau), the film stars Max Shreck as the rat-like Count Orlock, and was the beginning of an extremely popular genre, the vampire movie. It utilizes stop-motion photography (when Orlock’s coffin loads itself onto a carriage, with him inside) and double exposure (when Orlock disintegrates in the sunlight at the film’s climax) to evoke the supernatural. It was also a strong influence on filmmakers like Werner Herzog, who remade the film in 1979 with the inimitable Klaus Kinski as Orlock, and Coppola, who managed to achieve a similar atmosphere in the first act of his Bram Stoker’s Dracula. Shreck’s performance in Nosferatu was so convincing it inspired a legend that Shreck was actually a vampire dug up by Murnau for authenticity; this legend was the basis for the 2000 film Shadow of the Vampire, starring John Malkovich as Murnau and Willem Dafoe as Shreck. Probably the most influential film to come out of the German Expressionism movement, though, is Fritz Lang’s Metropolis (1925). The film, which opens with a series of dissolves between the various machines that make the city thrive, is a masterpiece of political science fiction and a clear middle step between the early Melies films and the special-effects pictures of today. Metropolis was one of the first films to make extensive use of miniatures, paving the way for films like King Kong (1933) and 2001: A Space Odyssey (1968). It was also the first film to feature a humanoid machine, or robot, and its theme of the interdependence of man and machine has been a major influence on sci-fi literature and cinema, especially in films such as Ridley Scott’s Blade Runner (1982) and the Wachowski Brothers’ The Matrix (1999). It was also an inspiration for Japanese artist/writer Osamu Tezuka’s now-classic manga of the same title, which was subsequently made into an animated film in 2001. Another Japanese animated film that owes much to Metropolis is Mamoru Oshii’s Ghost in the Shell (1992), based on Masamune Shirow’s graphic novel. It is interesting to note the comparison between Metropolis and The Battleship Potemkin, both of which were released the same year in different countries, both of which are stories of worker rebellions. Perhaps the most interesting difference is that, in Potemkin, the workers take control of the machines, whereas, in Metropolis, a machine (disguised as Maria, a worker’s daughter) exhibits control over the workers. As a whole, German Expressionism was a major influence on the American film noir of the 1940s and ’50s, several of which were directed by Lang. This movement then gave birth to the French New Wave cinema of filmmakers like Jean-Luc Godard, Francois Truffaut and Jacques Tati. Today, filmmakers like David Lynch, Martin Scorsese and Quentin Tarantino have created their own new vision of this grand tradition. 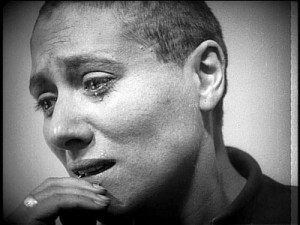 Arguably the greatest film of the silent era is Dreyer’s The Passion of Joan of Arc, a starkly beautiful masterpiece composed mostly of close-ups. Melle Falconetti, as Joan, delivers an absolutely chilling performance; the scene in which she contemplates recanting her mission from God in order to end her own suffering is particularly effective. It is a shame this film is not more widely seen now, in the wake of Gibson’s The Passion of the Christ, which is almost as much a tribute to Dreyer’s film as it is to Jesus. Besides the structure of Gibson’s film, two scenes in particular are clearly influenced by Joan: one in which Roman guards torment Jesus is practically identical to (but bloodier than) Joan’s tormenting, right down to the crown of thorns (though Joan’s is symbolic). The other has to do with the climax of each film, which bear striking similarities as well. The Passion of Joan of Arc is rich with religious symbolism throughout, the most obvious being the shadow of a crucifix on the floor of Joan’s cell, which is repeatedly blotted out by her persecutors. One other French filmmaker from the silent era worth mentioning is Luis Bunuel, who went on making acclaimed and influential films for decades after the advent of sound. His most famous early film is a 1928 collaboration with Spanish Surrealist painter Salvador Dali, entitled Un Chien Andalou. The short film purposefully lacks a coherent story, but is awash with unforgettable images, most notably that of a woman’s eye being sliced with a razor blade, intercut with a shot of a dark cloud drifting across a full moon – just one of many perfect examples of graphic editing in the film. Perhaps the most well-known example of the visual influence of Andalou on later films is found in the famous poster art for The Silence of the Lambs (1991), which incorporates the “death’s-head” moth in combination with another famous image from the short film to excellent effect. Bunuel’s Surrealist cinema has left its mark on many other modern filmmakers, from Lynch to Alex Cox (1986’s Sid and Nancy) and Whit Stillman (1990’s Metropolitan), to name just a few. Stanley Kubrick once said, “Silent films got a lot more things right than talkies” (as quoted in Flashback). While there have certainly been great innovations in film art since the silent era (with Kubrick himself at the forefront), analysis of these and many other great silent films proves that almost all the groundwork was laid in the first 30 years. The wisest of today’s directors are sure to be well-versed in silent films. With innovators like Lars von Trier (2003’s Dogville), Gaspar Noe (2002’s Irreversible) and Michel Gondry (2004’s Eternal Sunshine of the Spotless Mind), we are witnessing the legacy of an art form that began to claw its way toward respect and recognition nearly a century ago.